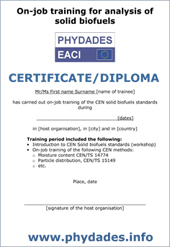 Join the PHYDADES Action and apply for the On-Job-Training! Phydades partners offer on-the-job training for laboratory personnel. Laboratory staff, like technicians, who want to be educated in the use of standardised analysis methods can work for 2-4 weeks in one of the laboratories of four Phydades partners. These are established laboratories carrying out solid biofuel analysis. The scope of the training is to strenghten the knowledge about analysis methods for soilid biofuels “standardised by CEN” in European countries, especially new member states. This is achieved with the experience and skills of important solid biofuel laboratories. The training is mainly addressed to expert laboratory technicians, but a general overview on biomass/biofuels utilisation will be provided during the introduction workshop. The training period is 2-4 weeks in autumn 2008 or spring and summer 2009. The training will be carried out in Austria (OFI), Finland (VTT, ENAS Oy), Spain (AICIA) and Sweden (BELAB). Each host organization will have 2-3 participants for their on-job training period. After the end of the training period, when training requirements are fulfilled, a Diploma attesting the successful participation will be given to participants. For further information, please click on the appropriate icon and download the flyer with a detailed description of the training or the short presentation of the training. If you are interest in this opportunity, please download the application documents (application form and CV template) for the on-job training. All instructions for your participation are included. Please note: Send your completed application form and CV before 15 December 2008 to apply for training in spring and summer 2009. The training is free for the selected participants; accommodation and travel cost are paid by participants.